Born to rule Although born to rule, Aidan lives as a scribe in a remote Irish monastery on the far, wild edge of Christendom. Secure in work, contemplation, and dreams of the wider world, a miracle bursts into Aidan's quiet life. He is chosen to accompany a small band of monks on a quest to the farthest eastern reaches of the known world, to the fabled city of Byzantium, where they are to present a beautiful and costly hand-illuminated manuscript, the Book of Kells, to the Emperor of all Christendom. Thus begins an expedition by sea and over land, as Aidan becomes, by turns, a warrior and a sailor, a slave and a spy, a Viking and a Saracen, and finally, a man. He sees more of the world than most men of his time, becoming an ambassador to kings and an intimate of Byzantium's fabled Golden Court. And finally this valiant Irish monk faces the greatest trial that can confront any man in any age: commanding his own Destiny. 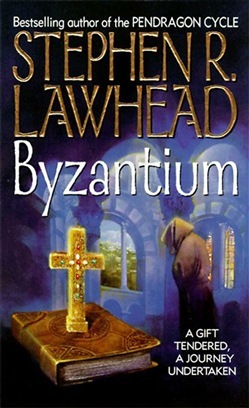 Acquista Byzantium in Epub: dopo aver letto l’ebook Byzantium di Stephen R. Lawhead ti invitiamo a lasciarci una Recensione qui sotto: sarà utile agli utenti che non abbiano ancora letto questo libro e che vogliano avere delle opinioni altrui. L’opinione su di un libro è molto soggettiva e per questo leggere eventuali recensioni negative non ci dovrà frenare dall’acquisto, anzi dovrà spingerci ad acquistare il libro in fretta per poter dire la nostra ed eventualmente smentire quanto commentato da altri, contribuendo ad arricchire più possibile i commenti e dare sempre più spunti di confronto al pubblico online.